The last week or so I’ve been keenly looking at day packs for the trail, mainly as I’ve been in the market for one myself 🙂 I’ve found some great options and done a few posts on some of them over the last weeks. Today, I am continuing in that vein by looking at another great little hiking day pack, the Osprey Talon 22 Backpack. Again, it’s purpose built for outdoor activity so it has a lot of great features that a good day pack for the trail should have. When I started looking into the Talon 22, I was very impressed at how much great user feedback it was generating. Overall, from what I can ascertain, in the Talon 22 we have a day pack that is built for the long term and so good value is a given. The pack is lightweight coming in at around 1 lb 8 oz (0.8 kg’s approx) and can comfortable store up to 20 pounds (9 kg’s) of gear. The Talon offers panel access with a zippered compartment as the main storage area in the pack as well as multiple convenient pockets e.g. on the hip belt, top of the pack, etc. It features an outer hydration sleeve for a hydration pack, note the hydration pack does not come as part of the pack. The Talon has a sleek and aerodynamic look about it, probably purpose built to help ensure maximum ease through the air when moving. There are plenty of adjustable straps throughout so getting a good fit should be no problem. The aesthetically pleasing look of this pack ensures that it will fit in just about anywhere and for just about any activity. There is a ventilating ridged foam back panel that will help keep your back fresh and dry. The pack has lot’s of attachment loops so whether you want to fit an ice axe, walking poles or a flash lamp, the Talon has the ability to do so. This is a purpose built pack for the outdoors. From all the user feedback I read on the Talon, you can’t go far wrong by adding this to your day pack kit for the trail. I’m sure it does fine for a weekend away too. On the downside, one thing it doesn’t have is a built in rain cover which, while not the end of the world as you can get one separately, would be nice to have. One final thing I feel I should mention is that I came across several folks mentioning how durable the Talon 22 pack is. With that in mind it is hardly surprising that this pack comes with a lifetime guarantee from the manufacturer. Can’t beat that! Multi-purpose outdoor use e.g. day hiking, running, cycling, city day break, etc. Lots of outdoor specific features e.g. a hip belt pocket, emergency whistle attachment, etc. So, in summary the Osprey Talon 22 backpack scores very highly across the board in nearly all departments for a perfect day pack. The one thing I note is no built in rain cover but that isn’t the end of the world by any means as they’re easy to buy separately. It’s great to see great design when it comes to a hiking day pack and even better when a manufacture is willing to stand over it with a lifetime guarantee. With that in mind as well as all the great user feedback across the web on this pack, I think you can be pretty sure you’re getting something of real quality. If you’re still unsure what day pack to go with check out more day pack options here. Also, If you’re unsure about what you should be looking for when buying a day pack for the trail, check out this buying advice which covers all the main points you should think about when making an informed decision. 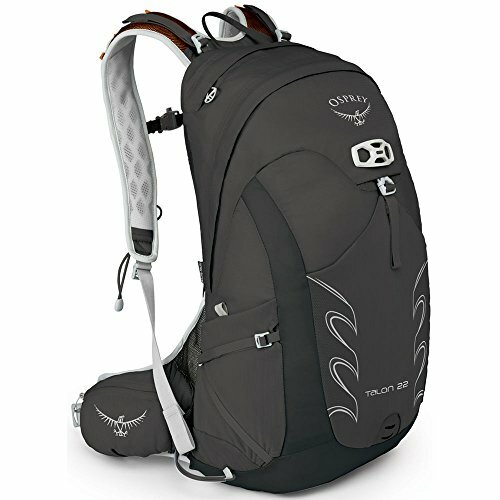 Have you used the Osprey Talon 22 Backpack? I’d love to hear about your experience with it in the comments below.